The Right to Protest | Frances Laing. Writer. Blogger. Journalist. Is Pauline Campbell’s life destined to be dramatised in television documentary drama? Update Wednesday 9th. June, 2010 F.L: At the time of writing the blog post which follows – I was unprepared for some of the reactions it engendered. As a result and with respect for the ethics of blogging as described by Rebecca Blood (Blood) instead of changing the core substance of what I’ve written I’ve added several updates to the post which can be viewed at the end. I wrote the post (perhaps wrongly?) assuming regular readers of this blog would already be familiar with many of Pauline Campbell’s outstanding achievements – especially since the work she did with organisations such as the Howard League and Inquest had been referred to many times in previous blog posts and articles. We know Pauline’s many contributions included her input in the development of the Corston report, for example. Without Pauline many feel the report would never have existed. My assumption (i.e that readers of this blog were already familiar with these achievements) sadly led one reader to conclude that I wished to diminish Pauline’s work, which was not my intention at all. In the short piece of writing which follows my intention was to focus on some of the little known aspects of Pauline’s story. In voicing an opinion on the campaigns with which Pauline was involved (based on information from interviews documented on this blog) I’ve also met with differing views on this very recent history. Some of these views are included in the updates at the bottom of this post. I’m aware the writing of recent history can be problematic and should remain a reflective process. I’ve tried to make the point on this blog many times that I believe the documentation of Pauline’s life to date is incomplete. One reader questioned my use of the term “official” story. Of course there is as yet no ‘definitive’ history of Pauline’s life – since the publication of this blog post I’ve become aware of just how many different narratives exist. But with the writing of this post – I hope a little more of the picture has come to light. I’ve always acknowledged there is more work to be done. In the public interest and not least because people are still suffering now from miscarriages of justice in penal institutions. Since the publication of this blog post – I have come under considerable pressure to change what I had written or remove it. This too, has prompted much reflection. When a journalist and/or blogger is asked to change what they have written or remove it – (unanswered) questions remain – not least regarding whether or not there truly is such a thing as ‘the freedom of the press’. From a professional point of view – I took the step of discussing the current version of the blog post in some detail with the ethics hotline at my union (the hotline serves as an educational mechanism). No outstanding ethical issues could be discerned at the present time. End of Update. Prisons campaigner Pauline Campbell who died on the 15th. May, 2008 became known as a “suffragette of penal reform”. Like the suffragettes of the 1920s – when she died many of her papers and records of core aspects of her life and work were lost. The police had confiscated Pauline’s computer and belongings were taken away in bin bags. Is Pauline’s life now destined to become the subject of a television documentary drama? The gifted screen writer Emilia di Girolamo has been commissioned to write a script. Emilia visits Cheshire this week. Of course we know the journey from page to television is a long one – and brings many challenges with it. Only when the script is finished will it be considered as a story for the screen. The documentary-drama-in-the-making would have the prison campaigning that Pauline was a part of as a central focus. In the years since Pauline’s death I have researched and recorded many of the lesser-known aspects of this campaign. I met Pauline in 2005. I believe the public meeting I organised in Chester in 2006 which I had asked her to chair must have marked the onset of her public appearances and her political engagement (see update at the end of this post). I attended Pauline’s Campbell’s funeral, her inquest, demonstrations after her death and memorial gatherings, including the memorial seminar held at Manchester Metropolitan University last year where I was invited to present some of this research(see links below). The research journey had often taken me to Joan Meredith – a close friend of Pauline Campbell. So I heard, researched and recorded not only the official account of how Pauline lived and died but also what happened in the friendships between Pauline and the activist women she knew and worked with. I learned that like other suffragettes throughout history – for Pauline it was friendship and solidarity between activist women which sustained her work and informed her campaigning and the political ideas she had. Firstly, from a journalist’s point of view, the tragic and dramatic details of Pauline’s life and the death of her daughter Sarah at Styal prison easily became a human interest story. Pauline’s arrests produced dramatic photographs and video footage. One grieving mother against the system? Secondly, many of the journalists who have documented aspects of her life did not live locally in Cheshire. Maintaining a professional stance – many of them could not possibly have been privy to the countless late-night phone calls Pauline made to her friends – the hours and hours of political talk and planning that took place between Pauline and her (sometimes male) but usually female friends. Thirdly, Pauline – meticulous as she was – often insisted that she be left to stand alone in front of the cameras and downplayed the assistance of other campaigners. She herself would have referred to the campaign as ‘her’ campaign. For very good reasons she wanted to be in control of the information flow at all times. She issued her own reports of demonstrations and often wrote to journalists – correcting their inaccuracies. Pauline Campbell stopped prison vans to protest against the death of women in prison. Truth or fiction? Is that how the campaigns worked? In a word, no. From the beginning, it wasn’t Pauline who physically stopped the prison vans. Joan Meredith did (together with other activists). I believe these activists included Yvonne Scholes, mother of Joseph Scholes. When the prison van was stopped the other activists ‘faded’ using a technique well-known to those familiar with direct action leaving Pauline in centre stage to face the media. What does it matter who stopped the vans? It matters. The stopping of the vans became the symbol of a movement of which Pauline was an important (but not the only part) and as Joan Meredith put it: “stepping out in front of the prison van was as important as Emily Davidson throwing herself in front of the King’s horse”. At Pauline’s funeral I recall sitting together with Helen John and Joan Meredith to research the article I wrote for Peace News. Pauline Campbell learned from and worked with these activists on a broad scale and if she had held out longer – she would have continued to do so. This is not something which has been mentioned or discussed in the mainstream media. Ignoring this central fact about Pauline’s story means underestimating the true impact she had on society and politics. And she continues to inspire us. The proposed title of Emilia di Girolamo’s documentary drama script is “A Duty of Care” (her web site tells us). A duty of care. We need to see it in the prisons system. We need to see it in Yarl’s Wood and Dungavel. We need to see it on our television screens. May 2010 meeting in Leicester of families – paying tribute to those who have died in custody. Report by the Institute of Race Relations (The day marked what would have been the forty-fifth birthday of Mikey Powell, who died in September 2003 after being detained by police in Birmingham and also marked the second anniversary of the death of Pauline Campbell). Link to blog post interview written to commemorate the first anniversary of Pauline’s death. Includes photographs of the files Joan Meredith assembled which detail core aspects of Pauline Campbell’s life in particular with regard to direct action and her connections with other activists much of this information has now been passed on to the Welsh women’s archive. Pauline was a lecturer at Newi college in North Wales. – and Frances Crook of the Howard League, speaking on the ‘Lost daughters’ campaign. Manchester Evening News Article. 2002 Protest. Pauline Campbell and Yvonne Scholes protest together. Includes picture of the two women. Joan Meredith’s Blog. Post describes a demonstration at Styal Prison in 2009 to protest against the death of Alison Colk. Pictures by Frances Laing. Demonstration also attended by Yvonne Bailey (formerly Scholes, mother of Joseph Scholes). I travelled with Joan Meredith as Pauline often would have done. Joan told me the details of the journey were the same as with Pauline, they always took flowers and Joan even described how she was the one who used to make Pauline’s sandwiches and coffee. It’s been pointed out to me that Pauline Campbell stopped prison vans on her own in later phases of protests. In the original blog post my intention was not to give the impression that every single protest she had ever been involved in was conducted in the way I’d described here. Since we are still at the beginning of documenting Pauline’s life adequately – how could we possibly know this? I used the words “from the beginning” to describe where and why the idea and the action had originated. My understanding is – that Pauline learned how to stop the prison vans from Joan Meredith and other activists and then went on to do this herself using the same technique. As facts and feelings emerge into the public domain, researchers link up and continue to put the pieces of the jig-saw puzzle together – fresh details of Pauline Campbell’s life come to light. In the original blog post I wrote “I believe the public meeting I organised in Chester in 2006 which I had asked her to chair must have marked the onset of her public appearances and her political engagement”. On a second reading of previous blog posts I note that (if the information I have to date is correct) of course Pauline had already attended the United Friends and Family gathering in 2003. (See this link). Nevertheless, the Chester meeting I believe was a important turning point for Pauline in terms of her political consciousness and her confidence. To my knowledge it was the first time she had taken on such an important public appearance – significantly – in a location so close to home. It must have taken tremendous courage to do so – and she did it magnificently. As far as the Manchester Metropolitan University Memorial Meeting in 2009 is concerned, sadly there wasn’t a video recording facility, but I have now received documentation of the event, including the running order of the speakers and for information, some of the memorial messages and a presentation that was given. A spokesperson for MMU confirmed: “Pauline generously gave up her time to visit MMU to talk to final year Criminology students. I understand she also made similar visits to students elsewhere in the region (e.g. University of Central Lancashire)”. I shall endeavour to find out whether or not the lecture given by Professor Barry Goldson at this meeting has been published. The title was: “Abuses of power and violations of rights: child imprisonment in a punitive age. A lecture in memory of Pauline Campbell” and the lecture included many vital insights into how and why our government continues to violate international human rights obligations – something which is particularly relevant to current campaigns and debates on child detention. It is hoped that MMU will be holding the event every year, although this is uncertain at present. I offer the following comments (in inverted commas) and alternative viewpoints – for consideration to the reader. They are comments made in the comments box of this blog. All comments are moderated as a matter of course. Comment: “Pauline stood in front of the prison vans on her own many many times but had people, including Joan around her who were all part of the military style approach to her protests, each one having a key part to play”. Comment: “Pauline stopped numerous vans alone right from the onset…she attended some of the very early protests with just a few close personal friends – no experienced activists in sight. This was also true of many of the later protests – the experienced activists had clearly ‘faded’. End of comment. (See interview conducted in December 2009 for an alternative viewpoint. F.L). See this link. Sky news two hours ago. The CWU has today announced that the postal strikes planned for Friday 6th November and Monday 9th November have been called off. The CWU said: “CWU and Royal Mail have reached an interim agreement that was unanimously agreed by the union’s Postal Executive today. The interim agreement will provide a period of calm for the CWU and Royal Mail to reach a full and final agreement. The interim agreement guarantees that modernisation will be introduced with agreed job security and improved terms and conditions for postal workers. It also addresses all the issues included in the long running local disputes. The strike ballot remains in place. The details of the agreement are embargoed until 12noon Friday 6th November 2009. Jeremy Dear said: “In a week when yet more photographers have been targeted by right-wing hate website Redwatch, when out on the streets professional photographers are subjected to violence and intimidation by right-wing thugs, there must be tough and urgent action in response to these latest death threats. “These are not idle threats made by kids – these are direct, named threats made by individuals who can be traced – in one case an individual already convicted of stabbing someone. They are designed to silence the media and stop photographers showing the true nature of the protests and protestors. The police must act now before a journalist is killed or seriously injured”. Jason N. Parkinson said: “It is ironic the English Defence League claim they are protesting ‘peacefully’ against Muslim extremism. Then late Saturday night, after returning from covering the Leeds protest, I receive a threatening email from one of their Welsh and English division organisers entitled ‘Fatwa’. * the operation was messy, and the condition very exhausting for every body involved, but it was significantly better than last time (27th june). * more than 2000 wanted to inter (enter?F.L. )Gaza, most went through. * we were told that approximativly 5000 in Gaza waited to pass to Egypt, most were turned back, while only about 500 passed. *the border was open for a long time, possibly 12 or more hours, till late hour at night. * there was a lot of activity at our camp, with members monitoring the days action, and facilitating where possible. Natalie Abou Shakra of ISM Gaza and Jenny Linnell have told me by email of the threats and intimidation they experienced whilst attempting to cross the border at Rafah. See my previous post ‘Natalie’s Testimony at the Gates of Hell’. The two women have now turned to the British Embassy at Cairo with a letter which raises questions about why they received such treatment, when (as described in the letter) they believe they had permission to cross and passage should have been assured. Their letter has been published here. 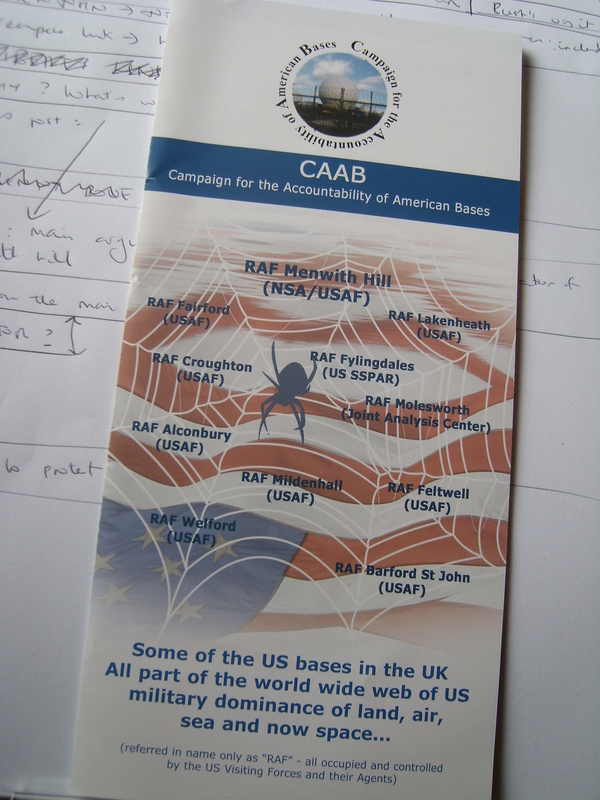 Campaign for the Accountability of American Bases. Leaflet. Lindis Percy is most famous for climbing up the gates of Buckingham Palace on Tuesday 8th. November, 2003. How and why did this trained nurse, midwife and health visitor find herself doing such a thing? Like some other activist grandmothers such as Helen John , Sylvia Boyes and Joan Meredith – she sees a clear and terrible contradiction in the world. Whilst some of us (particularly women) spend much of our time creating and protecting the lives of future generations, others are busy nuturing a new nuclear arms race. That’s my understanding of Percy’s Bush protest at any rate. Pretty basic, I suppose. Outrage. Percy’s involvement with Menwith Hill is fuelled by questions about this military base near Harrogate. Starting with “Why is Menwith Hill called an RAF base when there isn’t a runway there and it seems to be American?”).